Wacker Neuson's new RD12 rollers are the fifth generation compact rollers designed and manufactured at the company's Menomonee Falls, WI facility. The RD12 vibratory roller series is available with a gasoline or diesel engine option. Both units provide the same drum size, 34.5 inches, and front drum dynamic centrifugal force of 3,400 pounds that has become the industry standard for rollers in this class. The RD12A is powered by a 20.8-hp Honda gasoline engine and the RD12K is equipped with a 21.6-hp Kubota diesel engine. Fully recessed hydraulic motors provide excellent curb and side clearance allowing easy compaction near curbs, walls and in confined areas. Tapered frame and hood design provides for excellent visibility to the drum edges and more comfortable operation. Increased water and fuel capacity minimizes the need to refill during the working day, increasing jobsite efficiency. Ergonomically designed operator's platform provides comfort and efficiency. Both water and vibration functions are integrated into the joystick control for less hand movement. Fuel and water gauges are conveniently located for quick fluid level checks during operation. Unique hood design and pivoting floor plate provide for industry-leading service and maintenance access. Quick, tool-free and spacious access to engine, hydraulic and water systems contribute to lower total cost of ownership. Additional features include four point tie downs and lift points for easy transport; pressurized water system with eight-position timer, cup holder, steering wheel with steering assist knob, intuitive display and convenient armrest locations for operator comfort. 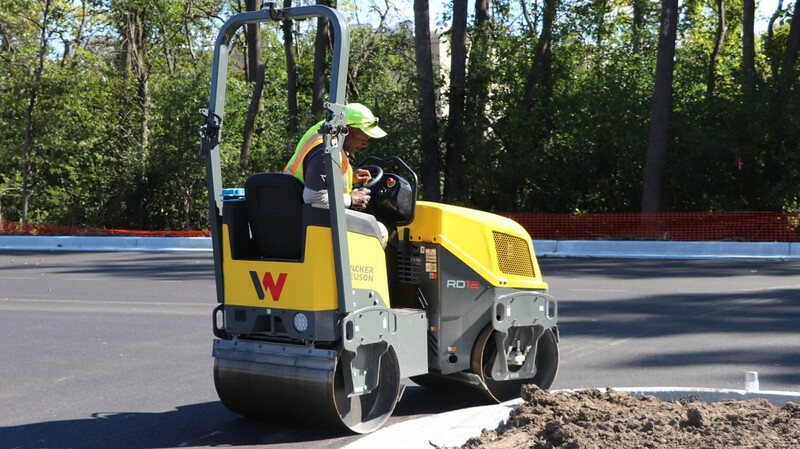 Wacker Neuson's new RD12 rollers are the fifth generation compact rollers designed and manufactured at the company's Menomonee Falls, WI facility. The rollers continue to feature the dual-drum drive and articulated steering that provides excellent maneuverability and compaction results.